Combining our "all weather" vinyl/resin fibers with our high quality plantation grown teak, this set is the ultimate in sophistication. Both materials are made to stand up various weather conditions. 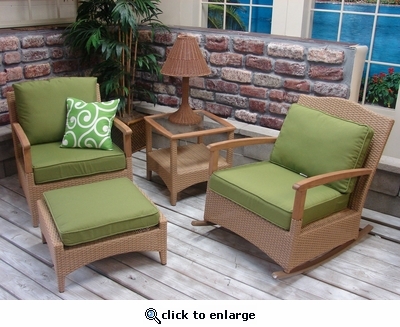 Cushions are included in your choice of premier outdoor fabrics. Sunbrella fabrics are available at an additional charge. Nature finish.